This week I thought I would tackle the problem of sauces. How many times have you longed for a real Hollandaise sauce at home, just like you tasted while out to dinner? Those instant packs are just nowhere near the same are they, in fact if the truth be told they are abominable! Last week's recipe for Beef Wellington suggested serving it with Hollandaise Sauce, well here is how to produce one and it will take less time than making the packet stuff. Traditional Hollandaise sauce recipes called for nearly twice the amount of melted butter and a vinegar reduction, however this results in a very heavy sauce. So I have reduced the butter content and replaced the vinegar reduction with lemon juice. This not only reduces the fat and cholesterol content but will give you a lighter sauce in both texture and flavour which compliments the more delicate type foods that this sauce is generally served with. Hollandaise means Holland style or from Holland. It is thought that Hollandaise Sauce was originally called Sauce Isigny after a town in Normandy, Isigny-sur-Mer, which was famous for its Normandy butter. During World War I, butter production came to a halt in France and had to be imported from Holland, which resulted in the name being changed to Hollandaise Sauce to indicate where the butter came from. The change of name stuck and you now have Hollandaise Sauce. Does Hollandaise Sauce sound better than Sauce Isigny? To clarify the butter, melt it in as small a pan as possible or in a small container in the microwave (the smaller surface area and the deeper the better). Once melted, allow to sit until the milk solids settle to the bottom then pour the clarified butter off. The Hollandaise sauce could be made just with melted butter but the milk solids contain a lot of salt and will make the final sauce very salty. 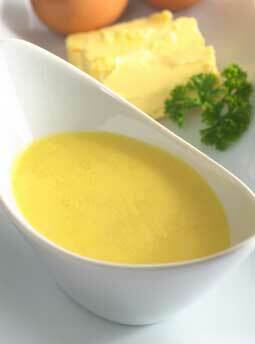 Great care must be taken when making Hollandaise sauce as it can curdle or split very easily. It is a sauce derived from the process of emulsion and coagulation. Therefore if the butter is added too quickly or is too hot, the albumen in the egg will harden, shrink and separate from the liquid. Enjoy your Hollandaise sauce and bon appetit . . .